The So Called Shift in Education. The use of "Bloom's Taxonomies" in the classroom. 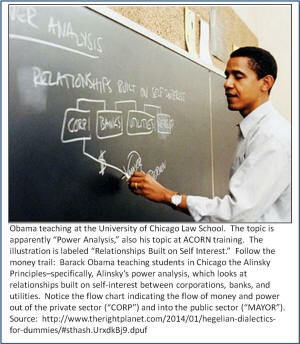 (Modernized by Marzano and then Webb, Obama's "Common Core" is based upon Webb's rendition). "Certainly the Taxonomy was unproven at the time it was developed and may well be ‘unprovable,'"
"adopted Ralph W. Tyler's [known for his development and implantation of the Delphi Process in business, government, and education] idea of an educational objective as a change in behavior; ways of acting, thinking, and feeling." "… a psychological classification system." "It has been pointed out that we are attempting to classify phenomena which could not be observed or manipulated in the same concrete form as the phenomena of such fields as the physical and biological sciences." "We are not attempting to classify the particular subject matter or content." "We recognize the point of view that truth and knowledge are only relative and that there are no hard and fast truths which exist for all time and all places"
"Only those educational programs which can be specified in terms of intended student behaviors can be classified." "What we are classifying is the intended behavior of students—the ways in which individuals are to act, think, or feel as the result of participating in some unit of instruction." "Educational procedures are intended to develop the more desirable rather than the more customary types of behavior." "Whether or not the classification scheme presented in Handbook I: Cognitive Domain is a true taxonomy is still far from clear." "What we call 'good teaching' is the teacher's ability to attain affective objectives through challenging the student's fixed beliefs and getting them to discuss issues." "The affective domain is, in retrospect, a virtual 'Pandora's Box.'" "There are many stories of the conflict and tension that these new practices are producing between parents and children." "To create effectively a new set of attitudes and values, the individual must undergo great reorganization of his personal beliefs and attitudes and he must be involved in an environment which in many ways is separated from the previous environment in which he was developed." "...many of these changes are produced by association with peers who have less authoritarian points of view, as well as through the impact of a great many courses of study in which the authoritarian pattern is in some ways brought into question while more rational and nonauthoritarian behaviors are emphasized." Weltanschauung1" - "1Cf. Erich Fromm, T. W. Adorno"
By adding the "affective domain," i.e., the child's "feelings" of the 'moment'—stimulated by and responding to the current situation, i.e., classroom environment—to the child's classroom experience, the child's "feelings" (and therefore his "thoughts," i.e., opinion) of the 'moment' determined the value or worth of the father's/Father's commands, rules, facts, and truth, negating the father's/Father's authority in the child's feelings, thoughts, and actions, as well as in his relationship with others (questioning, challenging, disregarding, defying, attacking the father/Father and his/His authority). Bloom admitted the "affective domain" was like "Pandora's box," a box full of evils, which once opened could not be closed, causing conflict and tension in the home. By "shifting" education (or any learning environment) from being facts based (do right - do not do wrong based) to being feelings based (stimulus-response based), group dynamics (psychoanalysis and psychotherapy) comes into play in the students life inside and outside the classroom, with the focus of educational objectives becoming the students behavior in regards to where his loyalty lies in any given moment or situation, either unwaveringly remaining loyal to parental authority (controlling, disciplining, humbling, and denying himself in order to do what is right and not wrong) or wavering along a spectrum from being somewhat loyal to parental authority (somewhat 'liberated' from parental authority, yet feeling guilty for doing wrong), to loyalty to group relations ("self" 'liberated,' yet feeling guilty for letting the group down), to loyalty to the process of 'change' (actively 'liberating' other children from parental authority—and the world from Godly restrain—with no sense of guilt for doing wrong). As Benjamin Bloom wrote: "It was the view of the group that educational objectives stated in the behavior form have their counterparts in the behavior of individuals, observable and describable therefore classifiable." "Only those educational programs which can be specified in terms of intended student behaviors can be classified." "What we are classifying is the intended behavior of students—the ways in which individuals are to act, think, or feel as the result of participating in some unit of instruction." "Educational procedures are intended to develop the more desirable [according to the child's "self interest" of the 'moment'] rather than the more customary [subject to the parent's authority, doing right and not wrong] types of behavior." (Benjamin Bloom, et al., Taxonomy of Educational Objectives, Book 1, Cognitive Domain) Bloom was concerned that traditional minded teachers might pick up on his agenda of changing the classroom learning environment from the teachers using their traditional teaching methods, i.e., teachers teaching facts and truth to their students in order to produce traditional (right-wrong) minded students, to where teachers using transformable teaching methods, instead encourage their students to learn through their "feeling" of the 'moment' (in the "light" of the current situation or classroom environment) in order to produce socialist (feelings) minded students. He therefore suggested that his taxonomy books not be read until after the teachers had first learned, i.e., had first been processed through their participation in "in service training," how to apply them in their classrooms (as well as amongst their peers). As Bloom admitted: "To create effectively a new set of attitudes and values [where feelings direct the individuals thoughts and actions, not established commands, rules, facts and truth], the individual must undergo great reorganization of his personal beliefs and attitudes and he must be involved in an environment which in many ways is separated from the previous environment in which he was developed." "...many of these changes are produced by association with peers who have less authoritarian points of view, as well as through the impact of a great many courses of study in which the authoritarian pattern is in some ways brought into question while more rational and nonauthoritarian behaviors are emphasized." (David Krathwohl, Benjamin Bloom et al., Taxonomy of Educational Objectives Book 2: Affective Domain) The "group grade" procedure used in the classroom is the same procedure used in "group therapy." If "alignment" of "theory and practice" (if opinion, i.e., flesh and the world), not belief and action or spirit and flesh, which are a dichotomy, i.e., which are at odds or in conflict with one another, being of different substance), i.e., if classroom experience and student behavior (if stimulus and response, i.e., esteeming of self, and not learning facts and truth, recalling them on demand, which requires self-control and self discipline, i.e., the humbling and denying of self) is the objective of education, then, based upon Bloom's world view, i.e., upon his "Weltanschauung," Marxism must be the outcome for student practice (behavior) since on page 166 of his Affective Domain Book 2, Bloom lists two Marxist's (Theodor Adorno and Erick Fromm) as the basis of his theory (opinion), i.e., as the foundation for his curriculum, which is required learning and applying in the classroom for teacher certification as well school accreditation. Marxism is the theory and practice for Common Core, where the child's or the adult's opinion and social actions (self interests and building relationship with others) become one-and-the same, transcending parental, national, and Godly restraint. It should be noted that our Constitution, unlike any other constitution in the world, was the result of men who recognized the father's authority in the home, 'limiting' the power of government in order to prevent it (in the national, states, counties or parishes, townships, cities, towns, and villages) from usurping his right of authority, not infringe upon his right of private convictions, family, property, and business, which is now nearly gone. If the "feelings" of the child or man takes the place of the father's/Father's authority then all that is under the father's/Father's authority becomes the property of the children or mankind only. Hegel, sounding more like Karl Marx than Marx himself, wrote: "On account of the absolute and natural oneness of the husband, the wife, and the child, where there is no antithesis of person to person or of subject to object [no father's authority over the children (and husbands authority over the wife)], the surplus is not the property of one of them [there is no private, as in private property or business, i.e., no "My family." "Not yours. "; "My property. Not yours. "; "My business. Not yours"], since their indifference is not a formal or a legal one." There is a consequence to basing 'reality' upon the approval of men, i.e., basing right and wrong upon the pleasures of the 'moment.' Anyone who attains pleasure from your children, your spouse, your property, your business, etc., has as much "right" to them as you do. By treating all beliefs as opinions and facts and truth as opinions, those of dialectic 'reasoning' make 'reasoning' subject to the flesh and the world, i.e., subject to their "feelings" of the 'moment,' i.e., subject to that "hope" which seeks only after the pleasures of the 'moment,' i.e., which comes from the flesh and the world, making man's thoughts and actions subject to his own "feelings" and the world alone, which leads to death. To make hope subject to the pleasure's of the 'moment,' i.e., subject only to the here-and-now, makes eternal life and eternal death no longer an issue (moribund), negating faith and belief, lasting facts and truth, in the process. It is why Bloom, placing hope in 'changing' the way that students think and act, from belief, facts ,and truth to opinions and theories, could write: "truth and knowledge are only relative and that there are no hard and fast truths which exist for all time and all places" (Benjamin S. Bloom, Taxonomy of Educational Objectives Book 1: Cognitive Domain), paraphrasing Karl Marx who wrote: "In the eyes of the dialectic philosophy, nothing is established for all times, nothing is absolute or sacred." (Karl Marx) In other words, all is subject to 'change,' i.e., subject to the flesh and the world (to nature) only.